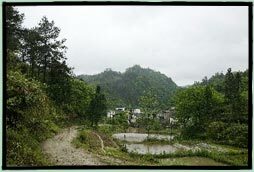 In 1996 Nancy Berliner, now the Curator of Chinese Art and Culture at the Peabody Essex Museum, saw Yin Yu Tang while traveling in the rural Huizhou region of China. The house stood empty, as the remaining Huang family members had left in 1982 to live in locations where job opportunities were less scarce. On a return visit, she learned that the family had just decided to sell Yin Yu Tang. Coincidentally, at the same time the Xiuning County Cultural Relics Administration was looking for a United States cultural institution with which to form a cultural exchange. Initial plans to move Yin Yu Tang to the United States unfolded in May of 1997, with discussions between the Huang family and regional Chinese authorities. The final agreement included other projects initiated in China to preserve and conserve historic Huizhou architecture. By fall 1997, the Peabody Essex Museum had incorporated the relocation of Yin Yu Tang into its expansion plans. In July 1997, Chinese engineers in Huang Cun made measured drawings of Yin Yu Tang, while Chinese carpenters labeled the home's components. Over the next four months, the carpenters dismantled the house, loading the components first into customized crates they had built and then into containers for transport. The dismantling process revealed numerous small items that had been placed intentionally within the construction with auspicious intentions. 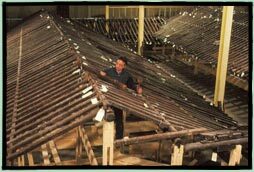 For example, crushed between the ridge beam and the top of each of the two central columns on either side of the central reception hall were a pair of chopsticks Other items, such as hairpins and bamboo curtains, had fallen through cracks in the floorboards. The house and its contents filled 18 40-foot containers and one 20-foot container. These were transported overland to Shanghai in November 1997, where they were placed on a ship bound, via the Panama canal, for New York City. In February 1998, they were delivered by truck to a warehouse in Massachusetts. It took three months to inspect and unload the contents, after which the crates were incinerated in accordance with USDA requirements. The original labeling system had been created by Chinese carpenters in circa 1800, when the house was built. A second Chinese labeling system was created when the house was dismantled in August 1997. During the initial United States inventory, in February 1998, a third labeling system was created using string and paper. Chinese labels were translated into English, and each component was entered into a database. As the components of the house were unloaded in Massachusetts, they were labeled, sorted, and inventoried by curator Nancy Berliner and Cowley Prudon Architects. In June 2000, preservation architects created permanent labels. Preservation architects made measured drawings of all 2,735 individual pieces of wood and 972 pieces of stone, as well as their assemblies: the timber frame, roof framing, room partitions, wood flooring, sandstone foundation walls, sandstone paving, and ceramic tile roofing. Beginning in June 1998, architects from John G. Waite Architects, and Associates, began to analyze the timber and stone components for reassembly. The process took approximately six months, during which they made use of videos, photographs, and drawings of Yin Yu Tang created by Chinese filmmakers and engineers. In the assembly phase, they were assisted by Jan Lewandoski, an expert on timber frame preservation. In August 1998, discussions on Preservation Guidelines began to establish parameters for preservation efforts. In December 1998, the architects began making drawings of the measured components. 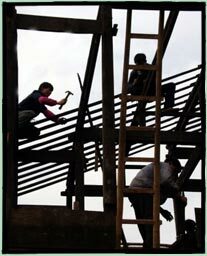 In March 1999, carpenters Zhu Jiming and Zhu Yunfeng traveled from China with interpreter Zhou Mo to consult on repairs. From June until March 2000, the architects surveyed all of the components, assessing repairs necessary to comply with the finalized Preservation Guidelines. The timber frame was re-erected at a Massachusetts warehouse in September 2000. This timeline shows the wide range of people, from family members to specialists, who were consulted on the Yin Yu Tang project from its inception to the re-erection of the home. September 1997 - September 2000 Oral histories are conducted with family members and village residents. September 1997 - present Research and interpretation planning. May 2000 Project is visited by Wang He, Cultural Attach� of Consulate General of the People's Republic, New York, and Jonathan Kuo, Deputy Director of US-China Council for International Exchange. July 2000 Peabody Essex Museum holds an interpretive workshop with participation from art museum curators and directors from across the United States. October 2000 Conservation work and preparation of site at the Peabody Essex Museum begins. Director and trustees of Peabody Essex Museum visit China. November 2000 World-renowned architectural historian Luo Zhewen visits from Beijing. April 2001 Students from Newton North and Newton South high schools in Massachusetts participate in school exchange with Xiuning County, Anhui Province. November 2001 Peabody Essex Museum meets with Chinese preservation architects and architectural historians in Beijing. April 2002 The Yin Yu Tang team from the Peabody Essex Museum travels to Huang Cun village. May 2002 Chinese education administrators from Xiuning County in China visit the Peabody Essex Museum and high schools in Salem and Newton, Massachusetts. June 2002 Re-erection of Yin Yu Tang on Peabody Essex Museum campus begins.